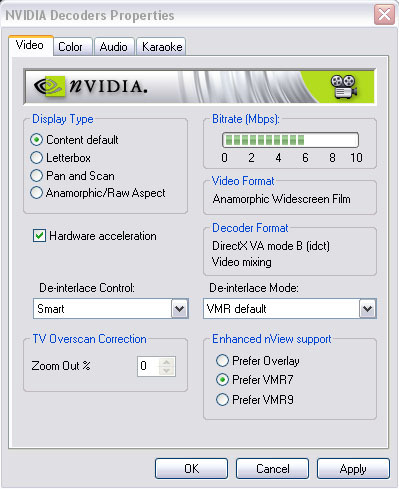 Color controls are disabled from within the Nvidia Purevideo Decoder properties under the Color tab. The only slider bars I can move around are Hue and Brightness. How do I fix this? Additonally, if the video player you are using for DVD or HDTV playback has its own properties with a setting for rendering format, if VMR7 is selected, you will not be able to adjust the Hue and Brightness settings. Under Microsoft Windows Media Ceneter 2005, the default mode set by Windows is VMR9 which supports Hue and Brightness. With Overlay or VMR9 setting, all color controls are available. This is a Microsoft limitation of the VMR7 mode.